We almost look at our websites as a ‘website out of the box’, we have an initial meeting to discuss the needs of the business and how we can get the most from your website. From that we will – register, design, develop, host, maintain, configure all social media and even support you FREE of charge for the first 12 months, all for one simple, competitive cost. We believe that producing a website in this manner completely eliminates a lot of hassle, time and effort for the customer. We are a company that thrives on 100% customer satisfaction, so if you’re not happy, we’re not happy! We price our websites competitively and to ensure great value for money with complete professionalism. 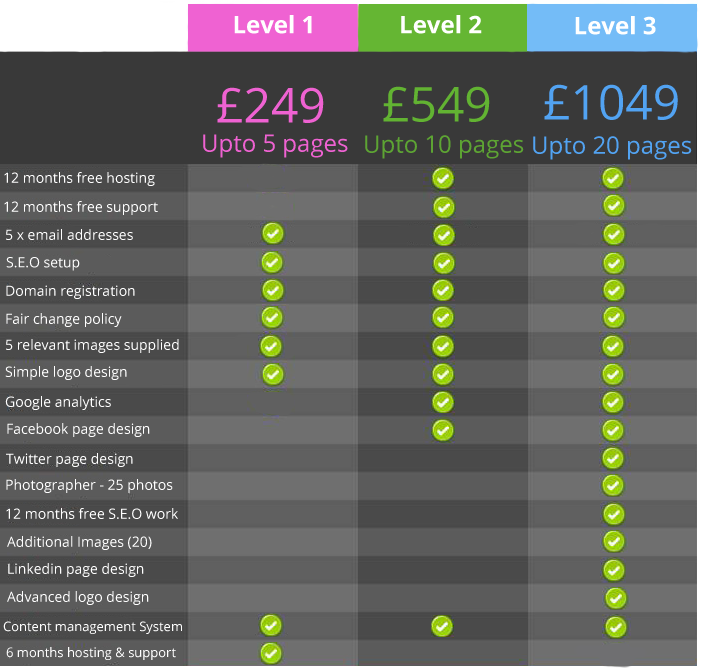 There are three levels of pricing – Bronze, Silver and Gold. Whether you’re a hobbyist or a international company, whatever your business, whatever your requirements we have a website for you.